TUCSON, Ariz.— The Center for Biological Diversity will unveil a stunning, 20-foot-long jaguar mural Thursday at an event at Borderlands Brewery in Tucson. The painting, by local artist Kati Astraeir, is a tribute to El Jefe, America’s only known jaguar, who lives just outside of Tucson. 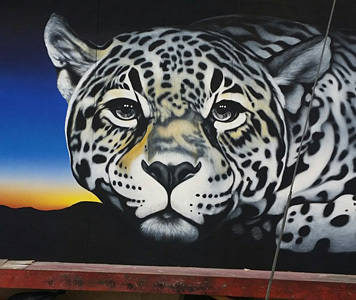 Mural of a jaguar by Tucson, Ariz., artist Kati Astraeir. Photo by Russ McSpadden, Center for Biological Diversity. This photo is available for media use. The jaguar artwork is the seventh in the Center's endangered species mural project, which places art in communities across the country to foster a stronger connection with local imperiled species. The other murals in the project are the monarch butterfly in Minneapolis; the mountain caribou in Sandpoint, Idaho; the Arctic grayling in Butte, Mont. ; the watercress darter in Birmingham, Ala.; and separate murals of the gray whale and yellow-billed cuckoo in Los Angeles. Who: Artist Kati Astraeir and Center staff will be available in the outdoor beer garden at Borderlands Brewery to answer questions about the mural, the endangered species mural project and the need to protect America’s only known jaguar, El Jefe, who roams the mountains southeast of Tucson. Media Availability: Center staff and others will be available for interviews before, during and after the event. Jaguars — the third-largest cats in the world after tigers and lions — once lived throughout the American Southwest, with historical reports on the South Rim of the Grand Canyon, the mountains of Southern California and as far east as Louisiana. Jaguars have disappeared from their U.S. range over the past 150 years, primarily due to habitat loss and historic government predator-control programs intended to protect the interests of the livestock industry. The last verified female jaguar in the country was shot by a hunter in 1963 in Arizona’s Mogollon Rim. Learn more about the Center's Endangered Species Mural Project and check out footage of El Jefe released earlier this year.